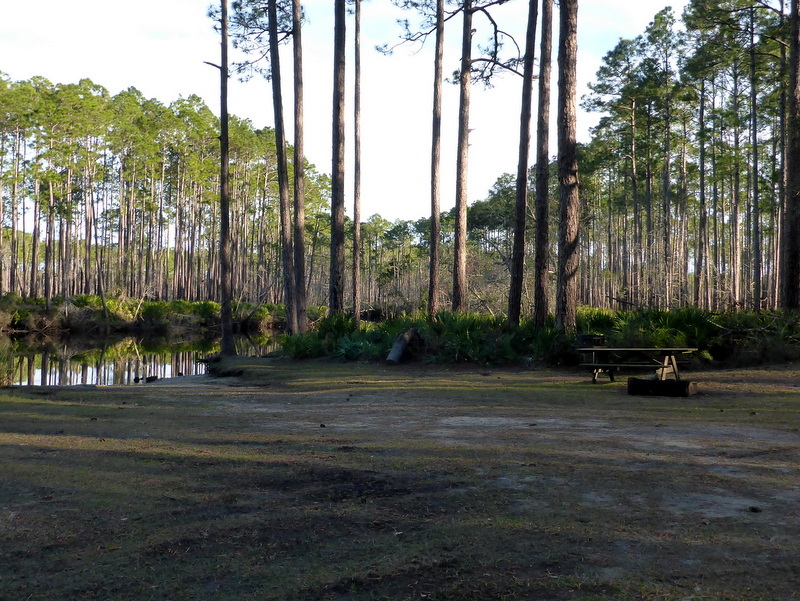 Reserve this site at Reserve America, campsite 3, New River, Tate’s Hell State Forest, New River section. When you arrive at this campsite, find the closest cell phone connection location. If you call 911, give this address: 3200 Billy’s Road, Tate’s Hell State Forest, GPS29.98360, -84.73929. First responders will not be able to find you if you only give a campsite number. Reserve America will not have this information on your confirmation. 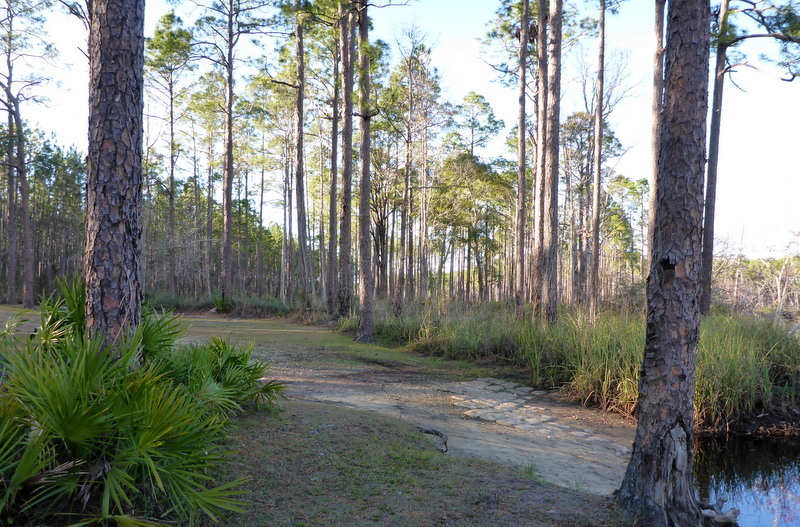 This is perhaps the largest of Tate’s Hell State Forest’s individual primitive sites. It has two ways to drive in. This side is 2 miles north of Gully Branch Road west of the bridge at the Gully Branch Day Use area. It is on the west side of the New River. Although right off Billy’s Road, there is hardly any traffic on this road. There is a landing for kayaks and canoes to the New River, but at low water levels, there is a steep drop. Views of the river, first downriver and below that, upriver. If this wasn’t a large enough site, there are wide pathways. This would be an excellent 8 person group campsite which insures some privacy for each tent. Or a large family outing. If you camp here, please comment on your experience. 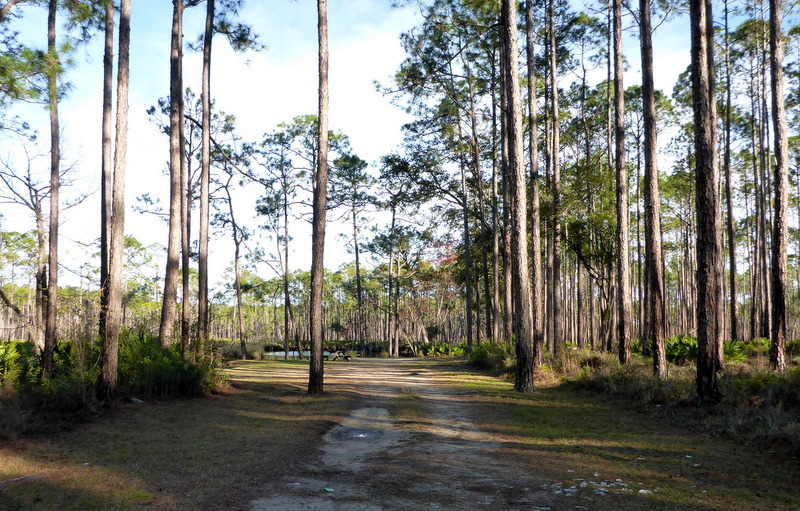 This entry was posted in Camping, New River, North Florida camping, Paddling North Florida, Paddling Tate's Hell State Forest, Tate's Hell State Forest camping and tagged Camping Tate's Hell State Forest, Florida camping, Tate's Hell State Forest camping on February 28, 2019 by marylynanded. 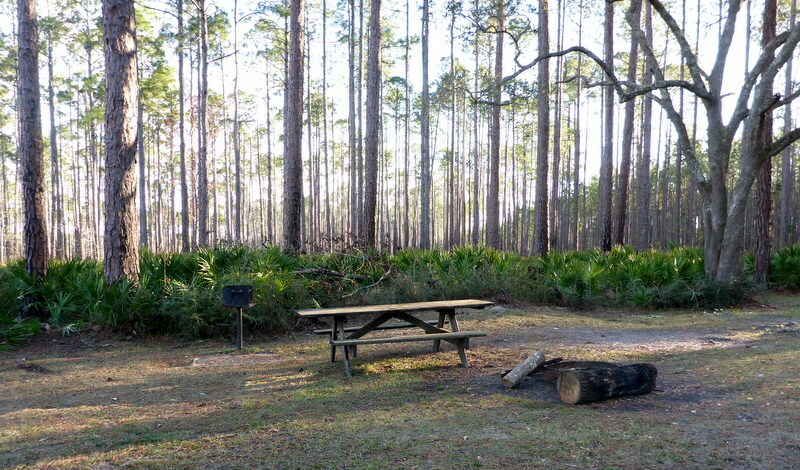 Reserve this site at Reserve America, campsite 17, Tates Hell State Forest, Juniper Creek section. When you arrive here, find the closest area you can get cell coverage. If you call 911 give 3650 New River Campsite #17 Road, GPS 30.00983, -84.75582, as your address. First responders will not know how to reach you with just a campsite number. Reserve America does not include this information in your confirmation. This is our favorite site in Tate’s Hell — we love paddling the upper New River, doing it up and back without shuttle. Except for the late winter, early spring months, the river is not fully navigable, but going up and back means we don’t have to drag the kayaks over shallow areas with insufficient water which might happen if we paddle downriver only. It can be a challenging 9.5 mile paddle: tree falls across the river, strainers and fast currents can make for surprises which can tax even experienced paddlers. It’s aggravating to find oneself being pricked or entangled by green briers which seem to be the most persistent vine on this part of the river. There is no close road access for about 9 miles of this section of the river. Once a year, we organize a paddle when the full river should be navigable, starting at FR 22 east of Sumatra. If we do the whole river to Pope Place, we camp here with the group, which we did in 2018. Photo from that trip is posted in a previous post. This year we plan to end the trip at this campsite, making it a shorter 1 day trip. This site easily holds 8 single person small tents with enough room to spare for a canopy. For tent campers there are fewer exposed tree roots on this site than other sites on the New River. There is a fire pit which is to the left of the picnic table. The launching area is one of the best of the Tate’s Hell SF campsites. One has a choice of a grassy/sandy flume (unlike the Dry Bridge Creek flume which is muddy) or a wider access to a lower section of the campsite which allows for several boats to be launched at the same time. The river was low when we were there, usually the water will come up part to where the first set of cypress knees (on left) , making for easy access. This is how the site looks from the river when the water is low. Clearly, the flume cannot be used when the water is this low. Note, that although the tidal current is not too noticeable this far up the river, the incoming tide will raise the water levels. Boats should be always secure if not brought up to the campsite. This site flooded when a group of paddlers were camping here years ago. The river rises and falls much more rapidly than one would expect and the lowest tenter was the first to raise the alarm after everyone had fallen asleep. All tents had to be moved to the entry road. This and many of the sites along the New River are leased during hunting season. The upper river view is shown first, then the lower river view. When we organize a group paddle for camping here, we rent a portable toilet. It is too difficult for individual holes to be dug here because of the tree roots. When camping with a family, a single large pit dug ahead of time with dirt troweled lightly after each use, is possible. 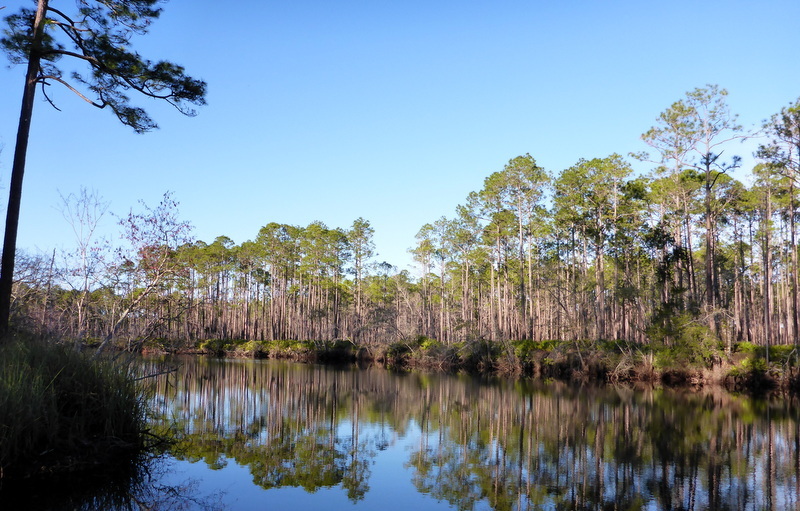 This entry was posted in Camping, New River, North Florida camping, Paddling, Paddling North Florida, Paddling Tate's Hell State Forest, Tate's Hell State Forest camping and tagged Camping Tate's Hell State Forest, Florida camping, New River, Paddling New River, Paddling North Florida, Tate's Hell State Forest camping on February 27, 2019 by marylynanded. We needed to paddle. Last week while visiting on two days not quite half of the 57 camping sites in Tate’s Hell State Forest, we saw the Dry Bridge Creek campsite with its grassy landing into what we thought was Juniper Creek. We did not recall paddling this creek, although, we thought we had paddled all the navigable areas of Tate’s Hell State Forest. This is where we headed today. We planned to first go upstream as far as we could and then return to the campsite put-in. Then to go downstream until what seemed on the map to be Doyle Creek and turn back. We intended to get mileages for both the upstream and back and the downstream and pack. That information might be helpful information to add to this campsite’s post. So we invited a friend, loaded all 3 kayaks on our trailer, and headed for SR 65, the western boundary of Tate’s Hell State Forest. The sky was overcast, some sun was predicted, but the temperatures were supposed to get to the lower 70’s. The high cloud cover remained, although the day became warmer. When we arrived at the campsite, the flowers were still dew-kissed: white violets, candy root, southern jessamine. Royal ferns were beginning to sprout. Tate’s Hell State Forest waters are tannin-colored. Going upstream the buckwheat trees were all in bloom. As warm as it was we did not see bees on the flowers of any of the flowering plants today. We did see a black swallowtail butterfly and a forktail. Going upstream, along the banks were large masses of either swamp or spider lilies and pickerel weed. In two months or less these areas will be blooming. Laurel greenbrier with green seeds promise food for bears in the forest. Spiders are beginning to weave their webs and by lunch time I counted 5 spiders which had fallen into my cockpit and which I had to move to a more natural setting. This is a elongated stilt spider and the photo below of a jumping spider. 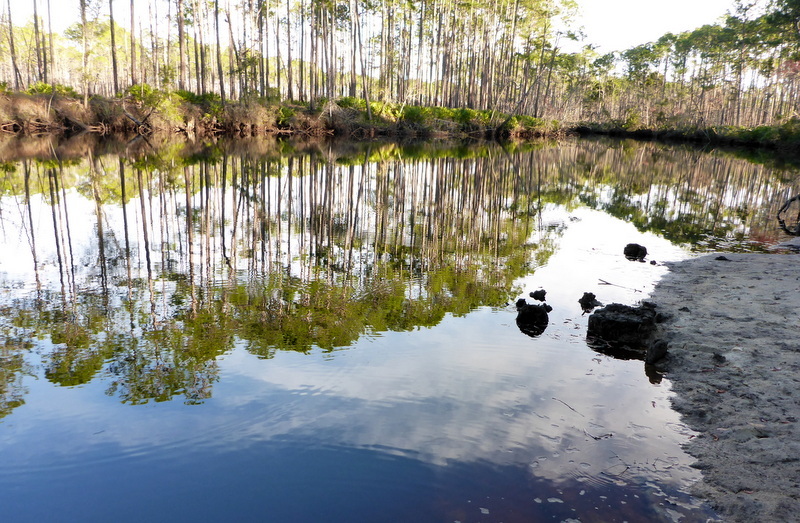 The distance of paddling possibilities along these creeks depend on tide and rain. We were able to get 1.7 miles upstream from the camping site before the narrowness of the creek, the trees and debris both above and under water made the endeavor more work than play. We returned to the camping site for lunch, but not without mishap. That lovely grassy put-in after launching 3 kayaks upriver, was less hospitable at take-out. One of the paddlers slipped on the mud getting out of his kayak, and again, as he pulled my boat up the, by then, muddy ramp.. After we returned home, we found that mud from this bank leaves a stain, despite several washings of clothes and paddling shoes. The photo below is of the final take-out . After lunch, still under a hazy sky, we ventured downstream to see where Juniper met another creek. Soon we paddled into estuary environment of marsh reeds and sedges and eventually found ourself at SR 65. We recognized this landing as the landing we took out a few years ago when we paddled Whiskey George creek. We had done this creek before: as Whiskey George creek, paddling, as we usually do to as far up as we can paddle and then turning back to the put-in. The distance from the camping site to this put-in was 2 miles. According to Garmin maps and DeLorme’s Gazeteer of Florida, that campsite is not on Juniper Creek but Whiskey George Creek. However, just a tad south of the campsite is Juniper creek which is east of Whiskey George and follows about the same pattern into the woods. An older very large map of Tate’s Hell State Forest names this creek running by the camping site as Juniper Creek. It also shows that the creek goes up to Whiskey George Campsite which we had visited last week and found no navigable creek alongside, although the site was in a swamp with water on 3 sides. So on a high water time, and also when winter temperatures are winter temperatures and not balmy late spring ones, we may attempt to paddle Juniper creek, as much of it as it possible. Yes, we have yet to paddle Juniper creek. And we did 7.4 miles of paddling on Whiskey George Creek today, putting in from Campsite 51, Dry Bridge Creek. If you paddle(d) Whiskey George Creek this far, please comment below in the box provided. 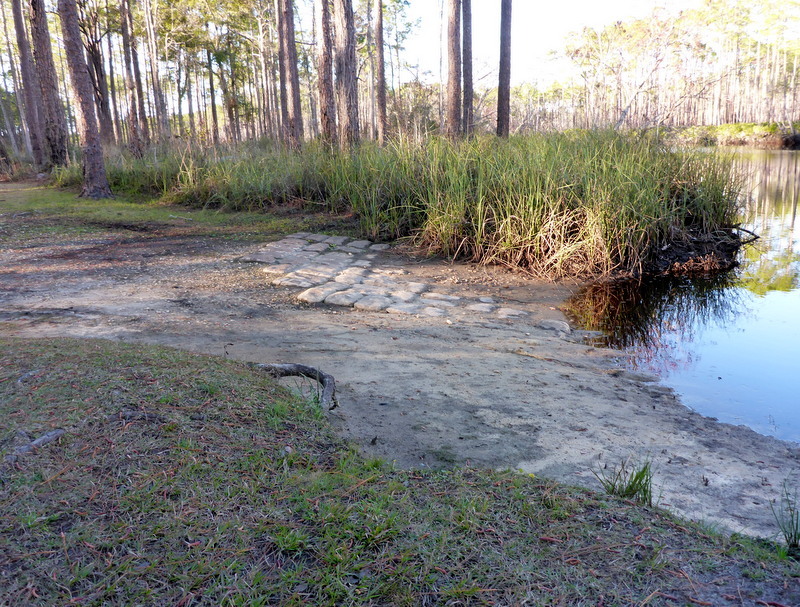 This entry was posted in Juniper Creek Tate's, Paddling North Florida, Paddling Tate's Hell State Forest, Tate's Hell State Forest on February 22, 2019 by marylynanded.